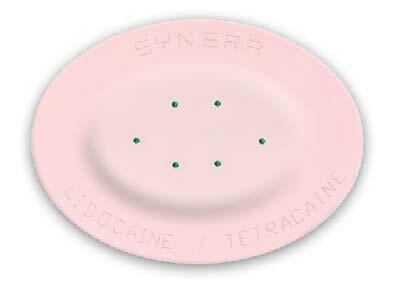 In 2014 the Drug Administration (FDA) approved a labeling change that allows SYNERA®1 (lidocaine and tetracaine) topical patch to be used at home. SYNERA® is a technological advance that can help prevent needle stick pain associated with superficial IVs and superficial dermatological procedures; it combines two commonly used numbing medications (lidocaine and tetracaine) with warming technology in a simple-to-use peel-and-stick patch. "The SYNERA® patch has been a game changer for our family," said Kelley C. a Registered Nurse and mother of three. "Before we used SYNERA®, my son, who has type 1 diabetes, often feared the needle and pain that accompanied insertion of his continuous glucose monitoring sensor. But now, we use SYNERA® before I need to insert the sensor, and he doesn't even wince." As part of SYNERA®'s availability for home use, MaxiMed has partnered with suppliers to mail direct to patient with other diabetic supplies. Discomfort and pain associated with needle stick is a real issue for some patients, especially children. That's why we're proud to offer SYNERA® as a local dermal anesthetic to help improve patients' experiences with superficial diabetic needle pain. ​By offering of SYNERA® for home use and direct-to-patient home delivery, we hope to provide patients with convenience and reassurance during their treatments.